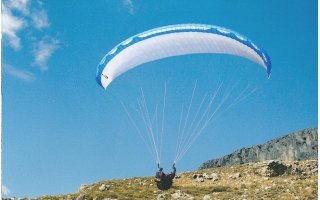 I have done a number of reviews on paragliders for magazines. I take the paraglider out, test fly it and report back on how it flies, and other aspects of ownership. The words and some pictures are my work, layout, editing of the words and provision of the other pictures is done by the magazine editor. In this picture I'm in Provence test flying an Airwave Sport. The picture was taken by my friend Kevin Back. To read some of the reviews I have done, select the links below. All the documents are Adobe Acrobat .pdf files, and will require Adobe Acrobat or Acrobat reader to view.